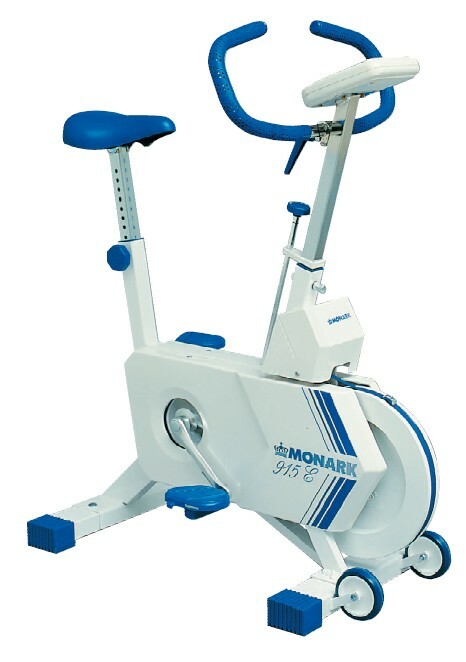 Monark 915E Exercise Cycle is a small and compact ergometer that can be calibrated. Displays watts and kcal at 60 respectively 70 rpm. This model is easy to use and extremely durable. Suitable for facilities with small areas. Monark 915E Exercise Cycle continues Monark's tradition of excellence with high quality engineering and opti-mum design. Rugged, functional and compact. With highly accurate instrumentation to measure heart rate, speed, distance, time and energy consu-med. Makes personal fitness training or home monitoring of prescribed cardiovascular fitness programs a simple and enjoyable experience. Order your Monark 915E Exercise Cycle from FitnessZone.com today! Unique meter showing both resistance and calorie con-sumption at 60 and 70 pedal revolutions per minute. Conversion table for watt-reading at other rpm's. Electronic readouts of time, heart rate measured with tele-metry type, speed, distance and pedal revolutions per minute. Heart rate is measured with telemetry type. Handwheel for adjustment of brake power. Stable frame, solid steel tube. Width 530 mm (21") at handlebar. Width 460 mm (18") at support tubes. Height 750-1180 mm (29,5-46,5") at handlebar. Height 800-1090 mm (31,5-43") at seat. Height 650 mm (25,5") without handlebar and seat. Order your Monark 915E Exercise Cycle from FitnessZone.com today!